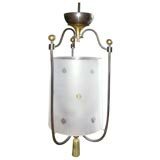 1940s octagonal Italian metal lantern electrified with on standard socket, original chain and canopy included. Delicate decoration makes this a lovely piece. 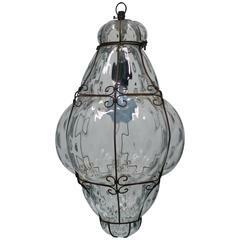 Old new stock small black metal lantern with large leaves. Six lanterns are available. No wiring. Orange glass bell jar lantern. New old stock. Includes canopy. 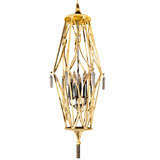 Gilt metal rope and tassel pendant light with four bulbs. 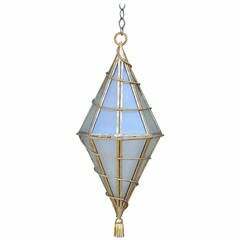 Spectacular Italian gilt metal geometric hanging lantern. Comes with extra-long (12 feet) custom chain. Italian ornate antique gilt bronze lantern. 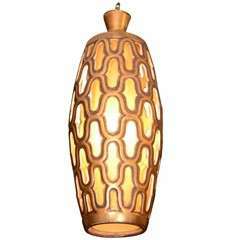 Four lights / E14 type / max 40W Measures: Diameter 15.5 inches, height 39.5 inches This item ships from Italy. A wonderful set of three chinoiserie octagonal mirrored and reverse hand-painted patinated lantern pendent with three candelabra lights in each. Each sold separately.